There was one show as a child that I watched religiously with the rest of my family. In fact, on Friday nights my Mom and my Godmother would usually take us out for dinner or to shop and we made sure we would always be home in time for TGIF. I was (am) the same age as Stephanie Tanner. I always wondered what it would be like to grow up with a big sister...and a little sister (I have a little brother). Or in a house without a Mom, but with a Dad, an Uncle Jesse and a Joey. And later an Aunt Becky, and a bit after that two cousins. The show I am referring to, of course, is Full House. 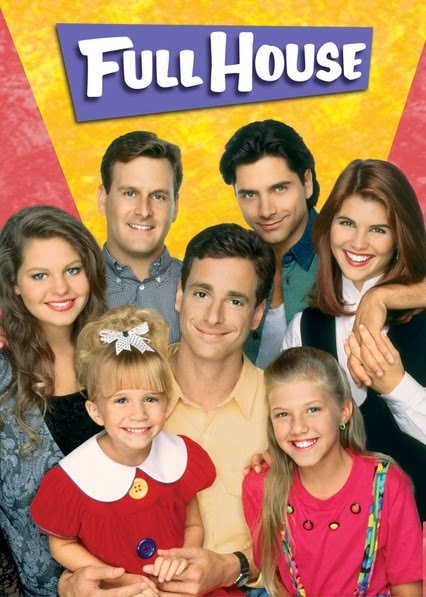 I'm definitely having some Nineties Newstalgia as the entire show is streaming now on Netflix and I watch with Hannah (it's still considered a "Mommy" show by her - although her favourite episodes include dancing and singing - she LOVED "Our Very First Telethon" and we've watched the dancing and singing portions more than once). I am BEYOND excited about Fuller House, and can't wait to catch up with the Tanner family - especially now that DJ has kids of her own! Two other "Mommy" shows I really enjoyed this month were Frankie and Grace and Schitt's Creek. I write "enjoyed" as I have had to spend some time off work due to a bad back since my car was rear-ended a couple of weeks ago...and I binge watched both seasons because I just couldn't get enough. This will be the show that makes my Mom finally figure out how to work Netflix. A Netflix Original Series, Grace and Frankie stars Jane Fonda and Lily Tomlin as frenemies who must come together to overcome the fact that their husbands are gay - and about to marry each other. For me, it was interesting to see the way things played out with the couples, their kids and their friends. There were funny points, sad points, but through it all the series felt so real and was engaging to watch. Full disclosure: I was a big fan of MTV's The Hills and an even bigger fan of Dan Levy of the Aftershow. So when I found out he had partnered with his Dad, Eugene Levy, to create a show I had to watch it. And watch it I did. In one day. Schitt's Creek focuses on a rich family who loses everything, except for the town the father (Eugene Levy) bought his son (Dan Levy) as a joke for his 16th birthday. How the Rose family adjusts to life in a small town, living in a motel and having no money is quite comical (as are the town folk they encounter) and I can't wait for Season 2. Which television families are your favourite?